Hydrea London Black and Cream Body Buffer is a large, stylish and super soft two tone buffer, making it an ideal bath and shower accessory that will look great in the bathroom too! 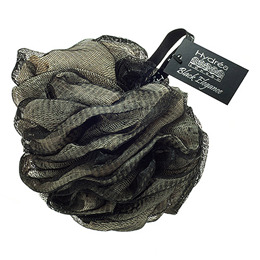 The dense layers of mesh help to create a rich lather and are the ideal texture for gently polishing the skin. Below are reviews of Hydrea London Black and Cream Body Buffer by bodykind customers. If you have tried this product we'd love to hear what you think so please leave a review. Hydrea London Black and Cream Body Buffer is a large, stylish and super soft two tone buffer, making it an ideal bath and shower accessory that will look great in the bathroom too! The dense layers of mesh help to create a rich lather.